Pre-construction pond consultation is invaluable. This picture shows what happens when Natural Habitats biologists are not involved with pond construction from the beginning. 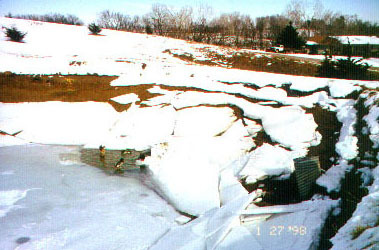 The owner of this property relied on the construction company to plan his pond. The company failed to recommend an "anti-seep collar" for the tube. The end result: the pond lost all of its water six months later (in a 6 hour period), washing out a driveway and a county road. Pre-construction consultation would have saved the owner over $8,000.